After an enormous fire destroyed the National Museum of Brazil in Rio de Janeiro on Sept. 2, 2018, the Bendegó meteorite was one of the few artifacts left relatively intact. The meteorite is the largest space rock ever discovered in Brazil. Among the space rocks that survived the blaze is the Bendegó meteorite, which is the largest meteorite ever found on Brazilian soil. The iron-nickel meteorite is one of about a dozen meteorites housed at the museum. An artist's illustration depicts the transportation of the Bendegó meteorite from the Brazilian town of Monte Santo to Rio de Janeiro in 1784. When the locals first attempted to transport the meteorite to the nation's capital using a wooden cart pulled by oxen, an accident sent the hefty space rock tumbling downhill and splashing into a stream, according to the museum's description. The rock stayed there for another century, until Brazil Emperor Pedro II had it removed and relocated to the museum, where it has been on display since 1888. 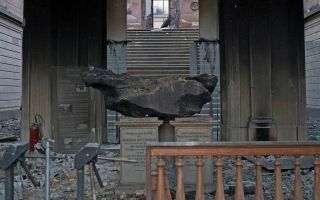 Many other priceless artifacts were in the museum during the fire, including the 11,000-year-old skull of a Paleoindian woman named "Luzia," the reconstructed skeleton of a huge dinosaur known as the Maxakalisaurus and several Egyptian mummies. The Bendegó meteorite sits on display inside the entrance of the National Museum of Brazil. Officials have not yet been able to tally the damages, as investigators have been instructed to hold off on their work until engineers declare the building safe to enter, according to The Guardian. However, one official told The Guardian that an estimated 90 percent of the museum's artifacts have been damaged or destroyed. In the case of the meteorites, it should come as no surprise that these space rocks seem to be resilient in the midst of a raging fire. Meteors, or fragments of asteroids that enter Earth's atmosphere, can reach temperatures of about 3,000 degrees Fahrenheit (1,650 degrees Celsius) as they plunge through Earth's atmosphere. This is hot enough to melt metals like iron and nickel found in many meteorites, but the temperatures inside a burning building don't get quite as high. A video shared on Twitter by the local radio station Rádio BandNews FM showed the Bendegó meteorite apparently intact atop its pedestal in the museum's entryway, along with a second, smaller meteorite in an adjacent room. These meteorites appear to be the only things left standing in a building filled with rubble and ash.